I got the idea for this vegan version of a deviled egg from this post on vegweb. I changed it up a bit to meet my tastes. I LOVE this recipe. And whenever I take it anywhere, everyone is always surprised and impressed with it. They really are super delicious, perfect bite sized appetizers, with zero cholesterol! I prefer mine served at room temperature, just like I do potato salad, because I think the flavors are stronger when they aren’t cold. With something like this, I usually just ‘eye-ball’ it until I get the right taste/texture, which is subjective. 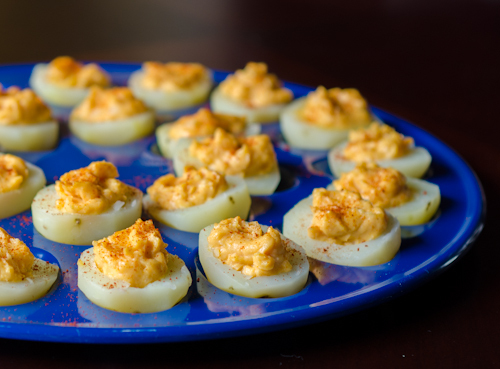 Plus, who uses a recipe to make deviled eggs? With that said, here are the ingredients and some guidelines for what I like in terms of amounts. Change whatever you want in terms of quantities or ingredients to suit your tastes. Peel the potatoes and boil them whole in a pot of water just until done. Do not over cook or they’ll be too mushy to use . Once cooked, drain them and allow to cool to the touch. Once cooled, cut each one in half. Scoop out a small amount of potato from each half. I use a melon baller to do this as it makes the perfect shape and pulls out just the right amount of potato. Plus it’s much easier to get clean edges using it. Put all of the ‘scoopings’ in a small bowl. Add the remaining ingredients to the scoopings and mix well. You will need to mash the potatoes a bit to get them to blend smoothly. Taste as you go and add more of anything you want. Once the filling is done, scoop some back in to each potato half just as you would a deviled egg. Once done, sprinkle the tops with paprika. *The key to this dish is the black salt, also called kala namak. I bought mine at a local indian grocery. This salt tastes just like hard-boiled eggs. When I take this to parties, everyone wants to know how I got these to taste like eggs. The black salt!